Most hunters are well aware of the techniques to employ when hunting deer, but newcomers and amateurs may need some deer hunting tips to get started down the right path in hopes of bagging that first buck. 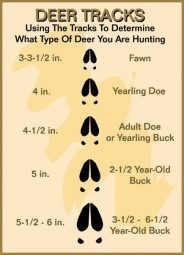 Here are some points to start with when hunting deer. A deer is hunted with either a bow or a gun. Each method has its own advantages but hunting with the help of a bow can be a lot harder as it needs great amount of skill. You should have a good understanding of this animal. Knowledge about the geography of the place where you will hunt the deer. Start early. You’ll notice that the hunting seasons are limited by dates but also be daylight hours. No guns are to be fired before sunrise or after sunset for the safety of all hunters involved. However, one of the best deer hunting tips you can follow is to start early. You should be in your deer stand or hunting blind before sunrise. Getting there that early will diminish the possibility of being noticed by the deer and allow you to be in place when the first specimens begin coming out for a drink and a bite to eat as the sun rises. Stay late. Those who have gathered knowledge and give out deer hunting tips frequently will tell you that the best times to bag a deer are sunrise and sunset. The lighting at these times of the day can actually confuse the sight of the deer, and they will be out in greater numbers because, aside from filling their stomachs at these times as a rule, they will be less likely to see you. Avoid scents. Do not wear perfume, cologne, after shave, or even strongly scented deodorant. Keep unnatural smells to a minimum so that you disrupt the highly sensitive sense of smell that a deer has as little as possible. Human smells spook these animals easily, and one of the best deer hunting tips to keep in mind is to let the wilderness cover your smell. This is one of the few times in life you may be better off showering later rather than in the morning before entering the woods. Most of all, keep in mind that silence is the key. While you are out there to have fun with your friends, deer also have a keen sense of hearing and anything above a whisper (and even a whisper if it is a particularly quiet day) can be heard by many cautious deer. This is the most important tip among deer hunters, as even the slightest sound as you are lining up for a shot can lose that prized buck for you. You can obtain this knowledge by reading various books on hunting or by listening to experienced hunters. Many hunters do not acquire this kind of knowledge and depend solely on luck. Deer hunting involves placing the shot at the right time and at the right moment. Although luck factor is involved, the skill is what matters the most. Hunters make use of antlers or sticks to simulate the sound of a fight between 2 bucks. This helps in attracting the deer to the hunter. Nowadays ‘deer calls’ (hunting aid) are available in the market, that are effectively used to attract a deer. Another method of hunting a deer is a combination of stalking and trailing the deer. Using this method, you can track any deer to its bed. The hunter is needed to keep careful watch on tracks as they can determine its exact location. If the trail becomes erratic, it means that the hunter should change the course of his direction and stalk the deer’s probable location. With the right deer hunting tips you can learn to select the right gun for hunting a deer. When you choose a gun, make sure that you are comfortable to use it. Although long range rifle guns have great accuracy, they are very heavy to handle. A lightweight model can be easy to carry but the problem is that it is harder to hold these guns steady to accurately shoot the target. If you are hunting the deer in cold weather conditions, then you must wear the right clothing. You should wear clothes that help to preserve your body heat. Wear alternating layers of clothing, this will help in maintaining the body temperature. A deer hunter should also have few things that include waterproof boots, knife, tree stands, camouflage and permit. When you are actually hunting and are close to the deer, you should stay very quiet. A little noise can alert the deer and the animal may become suspicious. Under any circumstances, the deer should not know that you are near to him. In short, before you go out for hunting, you must know about a few crucial tips as it will make your hunting experience a little more predictable. Deer hunting if done properly can be a very enjoyable sport. While there are more detailed tips available to make sure you get the most out of your trip, these deer hunting tips are the basics and will get you started down the road to success and enjoyment as a deer hunter. You can always refer to pages on this website if you want to know more about deer hunting. We have numerous articles on many types of hunting.